Johan Santana has been one of the most effective pitchers of the last few years. However, I question whether Johan will be able to maintain that level of success or whether he will be as big of a disappointment for the Mets as Barry Zito has been for the Giants. Let me explain why I say that. The video clip below is from a week ago when the Mets played the Cardinals. In this case, Johan Santana threw Albert Pujols a tailing fastball that Pujols hit off the end of his bat for a ground out to SS. The thing that concerns me about Johan Santana is that I see a bit of a timing problem in his mechanics. The thing to notice is the position of Johan Santana's Pitching Arm Side (PAS) forearm in Frame 74, when his shoulders start rotating. Rather than being vertical, it is horizontal. This can increase the load on both the elbow and the shoulder. It isn't until Frame 78 that Johan Santana's PAS forearm is vertical. A second thing to notice is how high Johan Santana's PAS elbow gets relative to the level of his shoulders. If you look at video of Johan Santana from his time with the Twins, you can see the same basic problem. Notice how in Frame 17, as Johan Santana's shoulders start to rotate, his PAS forearm is horizontal rather than vertical. The thing that bothers me about Johan Santana's pitching mechanics is that they bear a significant resemblance to the pitching mechanics of Francisco Liriano. Notice how high Francisco Liriano's PAS elbow gets in Frame 19 in the clip above. 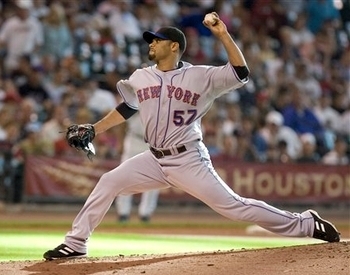 One thing that may help to explain Johan Santana's relative health is the angle of his PAS elbow. Notice how Johan Santana's PAS elbow is bent more than 90 degrees as his PAS forearm passes through the high-cocked position. Theoretically, this can reduce the load on both the elbow and the shoulder. I also think the fact that Johan Santana is more of a fastball/change-up pitcher, while Francisco Liriano is more of a fastball/slider pitcher, may help to explain their different fates.